Is Popcorn Fattening Or Not? 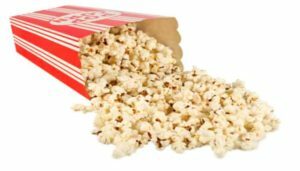 →Is Popcorn Fattening Or Not? I know you are here to know , is popcorn fattening or not? I wish this question could be answered with a simple ‘yes’ or ‘no.’ It’s something a lot of people want to know, and it’s something they want to know without hearing a big lecture on it. Unfortunately for them, there are a lot of different kinds of popcorn and each of them is carries a different amount of ‘fattening’ (which I’ll define adjoin in this article as ‘high calorie density’). That being said, here’s the shortest answer that’s still accurate – it can be. It can also be…. not? Not be? It can also be low calorie, is what I’m saying. I guess I didn’t answer the question up till now. I’m sorry. It’s just complicated. Popcorn by itself is not fattening. As in, it doesn’t have many calories for its volume.Popcorn is a vegetable that has been puffed up. Vegetables tend to be pretty healthy for you and the opposite of calorie-dense. The problem is that popcorn tastes appalling by itself. Another thing is that it’s not always easy to pop popcorn without a little bit of grease. These days, microwavable popcorn comes in just about every variety. You can get anything from a small, 100 calorie bag, to “movie theater butter” bags that pack 400 calories per bag or more. For comparison, a chicken breast, which serves as an entire meal, generally only packs about 250 calories. Popcorn, on the other hand, is counted by most consumers as a snack. 400 calorie snack vs. 250 calorie meal – I’d call that pretty fattening. Making your popcorn on the stove can yield some health benefits – such as avoiding some of the carcinogenic ingredients universally included in bagged popcorn, whether they’re low calorie or not. But, making your popcorn on the stove nearly always requires using some sort of oil at the bottom of your pan to keep it from burning. Depending on how wide your pan is – and most find it favorable to use a very wide pan to get the most popcorn popped out of it – this can mean adding as much as a quarter cup of oil to your snack. Oil is an incredibly calorie-dense food. A quarter cup of vegetable oil – the most commonly used oil for popping popcorn over the stove – contains over 480 calories from the oil alone. That’s before counting any calories that come from the popcorn, itself, or the melted butter that many people drizzle over it to give it the flavor we all love so much. Finally, we have the single healthiest way to make popcorn, and that’s with an air popper. An air popper doesn’t require oil because it keeps air flowing around the kernels, preventing them from burning (if you turn the popper off when you’re supposed to). A cup of popcorn fresh from an air popper contains only 15 calories. Obviously, most people aren’t going to have just one cup. The average bag of popcorn has about 13 cups of popcorn. That means you can get the same amount of popcorn for less than 200 calories. That might be twice as much as those 100 calorie bags – but keep in mind that those bags tend to only be 1/3 the size as a normal bag of popcorn. That means they only contain about 4 1/3 cups of popcorn. If you compare air popped popcorn to that, the air popped popcorn comes out to just under 65 calories. Now that’s a non-fattening snack! The light fluffy popcorn can be consumed because of the objectivity of it. Dietary issues are related with pop corn as it is one fiber item. To lead a healthy life people are ended up doing Popcorn Diet. But as I think to lead a vigorous life you need to eat all type of food which balances each and every term of your body. In your balanced diet you can intake which has an accurate proportion. Pop corn containing much GI (glycemic index) are said to avoid as it increases the blood sugar level. It eventually helps to reduce the daily intake of any other food because of the light airy affect. Remember one thing clearly; excessive intake of pop corn can be the cause of weight gain. So, it would be better if you maintain a balance of every balanced diet. I think it is bit rubbish if I say popcorn contains fewer calories than traditional fruits and vegetables. My little brother quarreled with me about the issue and stopped eating fruits after hearing such non-sense. I wanted to clear out something, if your popcorn is topped up with those delicious toppings or caramel, brown sugar, honey or chocolate then what’s the point in eating that for the sake of so called weight loss. One bag, air popped popcorn contains tiny amount of calories as I have stated above. But should I avoid eating fruits or vegetables? No! Not at all. Fruits and vegetables are fundamental items which completes our daily dietary chart. Why should you stop eating popcorn? However and whatsoever you eat in abundance can make you bulky and fat. First of all, stop consuming loads amount of calories. If you are concerned about the popcorn, try to avoid the microwave readymade popcorn and the big pan popcorn. These two methods carry the maximum amount of butter and oil. Please! It’s a request to avoid toppings if you are concerned about of being chubby. Try to tuck in Air popped popcorn; they will help you to do a bit of a diet as they make you a fuller. From the beginning, I am warning by saying excessive intake of anything is dreadful. So, understanding the facts, you may take that amount of popcorn which you think will not make you fat.